After a painful divorce, Casey returns to the haven of her childhood, great grandmother Weesie's tiny log cabin. Nestled in the Appalachian Mountains of North Georgia, the cabin rekindles memories of her happiest years as a young child enjoying Granny Weesie's tales of treasure. Casey seeks a peaceful refuge she will share only with her cat, Smokey. However, much more than early memories await Casey in Bluejay, Georgia. Weesie's childhood diary turns up in the cabin. The scrawled pages transport Casey back into the late nineteenth century. Far from finding the peaceful time she expects there, she uncovers a web of adultery, murder and intrigue that threatens to entangle Casey's twenty first century life. That life threatens to become more complex when her new neighbor turns out to be a handsome victim of his own marital disaster. Velma Lou seldom does anything altruistic. Hiring her cousin, Casey, as a reporter for her newspaper, The Bluejay Bugle, is no exception. Like the voracious vine, Velma Lou has learned the hard way to use her beauty to trap and ensnare. As Casey is drawn deeper into Weesie's life and times, her "real" life becomes more complicated by her growing attraction to Lee. Some strange occurrences happen in the cabin mirrored by tales of ghostly sightings in her family history. As she travels back to 1879, she meets an intriguing cast of characters. Donald Stuart, Lillith's faithful lover, David, his evil hearted twin brother, Ma and Da Garrett, Louisa's parents and her own direct ancestors, Louisa's brothers and the inhabitants of early Bluejay. When Casey becomes involved with a battered wife as she followers the case for the paper, she incurs the ire of an abusive husband, Zeke. Zeke believes he has every right to chastise his own wife and child. Casey begins to take his irate threats seriously when her car is sabotaged. Even Casey has to believe the number of life threatening happenings is no coincidence. This book was good,not great.It was about Casey,who moves into her grandmothers old cabin after a divorce.She finds a diary and when she reads is transported back to her grandmothers time.There is a professor across the road that she becomes romantically attached to.Lee Ann Howlett was good,not great,as narrator.Her male voices need some work.I was given this book for free for an honest review. What did you love best about Kudzu? The history of the the Appellation people and local. When Casey formally met the professor. Was she surprised as she had already met him informally in an earlier situation. I had no extreme reactions. There were tender moments, heart break, betrayal, mystery, murder, and intrigue. Nothing though that caused to laugh or cry. Maybe smile and pout. The book was listed as a historical romance, however it is more of a romantic suspense. There is historical background in dream time traveling sequences that Caesy experiences when she reads her great grandmother Weesie's diary while curled in her great grandmother's quilt. It was a love story, a travel through time and a mystery thriller all in one book. A very good listen! This is, in essence a “comfort read”, but comfort reads are wonderful for stressful or raw, rainy days, and it is easy to escape into a very vividly drawn unique setting while enjoying this book. True, there are few surprises, and I have seen variations on almost all of the devices the author uses, including the multi-generational story working out its fate, and the time travel/dreaming sequences. However, they are managed very nicely, and, while not unique, are also never trite or shallow. While not a thriller by any stretch, the mysteries are engaging, mostly because of their echoes through the history of the families involved, and the characters are very nicely drawn. True, the descendants very strongly resemble their predecessors, and play almost the same roles, but again, the writing and character development is strong enough to support the plot. There is also some history of the area, and some nice information about the “old ways” that was very interesting, especially since I am familiar with weaving, spinning and quilting. By the end of the book, I realized that I had fallen under its gentle spell, and become emotionally invested in these families, and very interested to see how the unfinished “business” of their fates would be resolved. Everything is resolved, in a nice, feel-good, satisfying way, too, and the book left me warmed and smiling. The narrator did a very competent job, giving each character (past and present) a unique way of speaking that made it easy to keep everybody straight ..not always easy in a book that follows family histories, as this one does. I would give the book 4 stars and the narrator 4 stars, as well. ***I was give a copy of the audiobook in return for an honest review. This book was a pleasure from start to finish. The way it is presented, with time travel and present day had visions of a movie going through my mine. You are able to visualize what the community was like 100 years ago and how it has evolved. With the underlying supernatural theme, and the romance between Casey and Lee, you will find an enjoyable listen. Lee Ann Howlett does the perfect narration for this, creating a world that you become entirely enveloped in. There is a particular flavor to stories that feature small towns in the south, and Kudzu is no different. Told from the perspective of Casey, who moved into her grandmother’s old house to lick wounds, she discovers an old diary and is transported to live her grandmother’s life. Far from being a smoothly comfortable trip, Casey finds murder; intrigue and a mystery to solve that may actually help her to modify events to make her time better. .Beautifully written with description that drips with southern sense and charm, events quickly start to take off in unintended directions, not unlike the Kudzu that the story is named for. Narration for this audiobook was provided by Lee Ann Howlett, I’ve previously listened to one of her narrations of an F. Scott Fitzgerald short, and again she did not disappoint. Her diction, simple inflection and tonal changes and subtle delineation from one character to the next are perfectly suited to the text and are a great enhancement. With the integration of the past ills and secrets, and discoveries that Casey makes about her family, their history and the resulting events that were generations in the making, this is an easy and interesting escape listen, with a gently developing romantic attachment between Casey and Lee that brings a smile. Sounding very honest and genuine, with a touch of meandering, this is a good listen for an afternoon’s quiet entertainment. I received an AudioBook copy from the author via AudioBook Jukebox for purpose of honest review for the Heard Word. I was not compensated for this review: all conclusions are my own responsibility. Great story but honestly fell it didn't truly explain what kudzu was this was more history and mystery and should have been called The Diary. Would you try another book from Kathleen Walls and/or Lee Ann Howlett? Would you listen to another book narrated by Lee Ann Howlett? probably not...but maybe...depends on the topic! 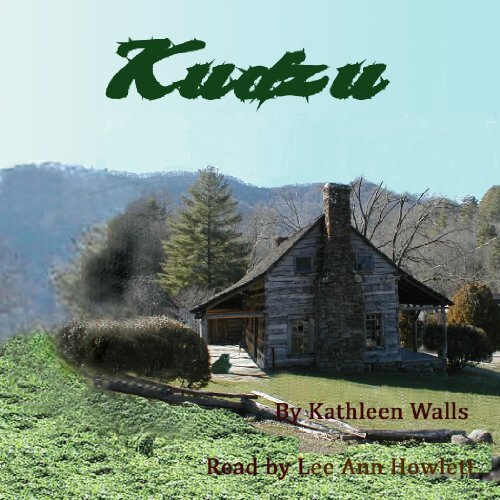 Could you see Kudzu being made into a movie or a TV series? Who should the stars be? I really wanted to like this...I like a mystery, I like some supernatural elements, and I like romance...this just didn't do it for me....it is an interesting story and the relationship between..Casey and Lee is sweet....but the narration was not great and I got bored at times....just not my cup of tea! Probably would have really liked it if I just read the actual book itself! Fast paced suspence Southern Style. If you could sum up Kudzu in three words, what would they be? Mystery, Time Travel and Romance set in a small southern town. A divorced Casey has returned home broke to live in her Granny Weesie's tiny cabin. She finds her Granny's diary and as she reads it she is transported back to when Weezie was a teen. As she reads it we learn what it was like to live in a small town in Georgia in the late nineteenth century. I am always facinated by stories set in small southern towns during this time period. The author Kathleen Wells does an impressive job of showing both the hardships and the way people worked together to make the most of what they had. It appears Weesie is trying to tell her something and it has to do with her early life.The other part of the story revolves around the same small town today. Many of the people are decendants of the folks Casey is meeting in the 1880's. The book does an excellent job of transporting us to life in a place where there are no secrets and everyone knows what you are doing almost before you have done it. There are lots of great local characters who seem to have the ability to "see" the future. Meanwhile Casey is fighting for her life as many strange accidents start happening. She is alone except for the new neighbor who is the only person she can count on.This book is a page turner and keeps building up the suspense until the end. I would highly recommend it. I have not listened to other books narrated by Lee Ann Howlett. The male voices were not great in my opinion. The story itself was so captivating that I easily continued listening to it. I was provided this audiobook at no charge by the author, publisher and/or Narrator in exchange for and unbiased review via AudiobookBlast dot com.I will be looking for other books by Kathleen Wells to purchase. Decent book, but poor narration. I think I would have enjoyed this book more if I had just read it. The story was okay.It is about Casey, who has escaped after a divorce to a mountain cottage left to her by her grandmother. She starts developing a relationship with her closest neighbor, a scholar that is a specialist in kudzu, a plant common to the area. Casey finds her grandmother's diary and is transported back to her grandmother's life as a young woman. She discovers situations of adultery,murder, hard times and hidden treasure.Back in her own time, she is dealing with break-ins at her cabin, an abusive man in the area and even murder.The relationship between her and Lee is sweet. I found the narration difficult to listen to. It may be just my personnel preference, but if I had to do it over again I would just get the book.